If you need to measure RPM in experimental setups but don’t want to invest a lot of money, consider using a bicycle speedometer. You can get reasonably accurate measurements digitally displayed using an inexpensive ($15) bicycle speedometer. All you need to do is attach a magnet to the rotating part of the device, position the magnetic sensor reasonably close (6mm or .25”), and program the “wheel factor” correctly. All the bicycle speedometers I’ve used program the wheel circumference in mm as the “wheel factor” whether you set them to read in mph or km/hr. The settings are in the table below. I’ll provide the derivation at the end for those wanting more details. It’s important that you set the correct “wheel circumference” depending on whether you are going to display the RPM using MPH or km/hr. Ideally you’d like the readout to be 1 mph = 1 RPM or 1 km/hr = 1 RPM. The speedometers I’ve used don’t accept a wheel circumference that large so you have to compromise on something smaller. For RPM greater than about 100 you can program the speedometer for the 1 mph = 10 RPM setting and just multiply the result by 10. Because these speedometers typically read to 0.1 resolution you’ll still have 1 RPM resolution. Maximum reading is 199.9 so you’ll be covered to 1999 RPM. Make sure your magnet will stay attached with the centrifugal force if you’ll be using it at high RPM. I also use the 6 RPM setting above which indicates (revolutions/second)/ 10 or (Hz / 10). I use this scale when Hz is more convenient than RPM, especially for computing engine power. 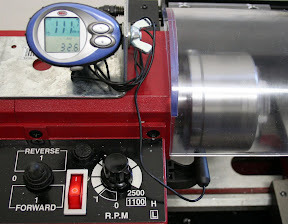 If you’ll be measuring low RPM the 1 km/hr = 4 RPM will be more useful. The minimum indicated speed for a stable reading will depend on how fast the speedometer updates values. You’ll get accurate readings interspersed with a zero readings. I’ve seen around 4 to 8 mph minimums. I especially like to use two or four magnets on this scale. Not only will you be able to measure lower RPM, but the math also gets easier. With two magnets (equally spaced of course) you’ll multiply the indicated value by 2. With four magnets you’ll get the desirable 1mph = 1RPM and be able to accommodate up to 199 RPM. To have 1 mph = 1RPM means the “wheel” would travel one mile in one hour and would turn 60 times (once per minute). So the circumference would be 5280 ft/60 = 88 ft. Converting 88 ft = 88 ft x 12 in/ft x 25.4 mm/in = 26822mm. This number is too large but 26822mm/10 = 2682mm will fit (my speedometer has a maximum wheel circumference of 5999mm). 26822mm/4 = 6706 won’t fit on the mph scale. Once you have the circumference for 1mph = 1 RPM you can divide the circumference for any value you like provided the speedometer can accommodate the wheel circumference. So if you want 1mph = 5 RPM then use 26822/5 = 5364 mm for a wheel circumference. Similarly for metric units 1km/hr = 1RPM so 1000m/60 = 16.667m or 16667mm. 16667mm/4 = 4167mm will fit. You could also program 16667mm/3 = 5556mm, but you’ll need to multiply the km/hr reading by 3 to get RPM. I bought the cheapest bicycle speedometer I could find at Kmart. I see Amazon has the same model. Amazon also has a Schwinn model for $10 that should work–but I haven’t tested it. Tachometer Part 2 –I’ve tested the Schwinn Speedometer and some updates on the Bell Speedometer.